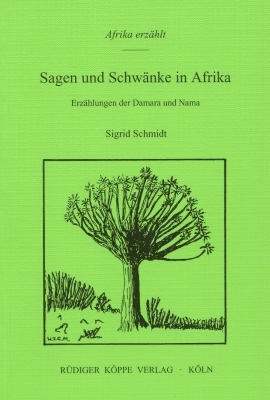 While living in Namibia in 1959-1962 and during eight additional field trips between1972 and 1997, Sigrid Schmidt collected many hundred folktales among Nama, Damara and Hai||om. It was her aim not only to record the texts on cassettes but also to learn as much as possible about the spiritual background as well as about the everyday life of the narrating communities. The ten volumes of Afrika erzählt document a selection of this oral treasure (volumes 1 to 7 in German, volumes 8 to 10 in English). The tales reflect the great variety of the oral traditions between Berseba and Tses in the south to Tsumeb and Khorixas in the north. As during the last decades the telling of stories has decreased considerably many of the tales of this series are unique examples of an already forgotten heritage. In addition to representing the texts the author analyses them on various levels, mainly as literature and in comparison with African and international folklore. In this way she could identify – next to the ancient African traditions – a considerable number of tales which early European settlers (Huguenots?) had brought orally to the Cape, tales which still live on in Namibia. Each volume is devoted to a special subject: volumes 1, 7 and 10 to the international texts, volumes 2 and 9 to ancient African tales of magic, volume 3 to the tales about primeval times and the trickster, volume 4 to animal tales as well as the role these animals play in everyday life and belief, volume 5 to legends and jests, volume 6 to personal experience stories of the narrators. Volume 8 gives a summary of all subjects. These stories were told by 172 persons. Many types are represented by several examples. 4; 5; 8A; 49A; 56A; 56C; 56D; 58; 62; 66; 72; 78; 92; 126; 154; 155; 175; 185; 223; 225; 235; 300; 301; 302; 303; cf. 304; 311B*; 313; 314; 314A; 315; 325; 326; 327A; 327B; 329; 331; 365; 366; 400; 403; 403B; 409A; 425A; cf. 425M; 433B; 461; 480; 506; 510A; 510B; 511; 511A; 513; 530; 531; 532; 533; 550; 554; 555; 560; 563; 567; 570; 613; 650A; 653; 653A; *653C (945II); 665; 670; 675; 676; 700; 706; 707; 709; 720; 750A; 780; 781; 785; 850; 851; 853; 875; 922; 923; 934H; 939A; 956D; 960; 990; 1091; 1137; 1152; 1159; 1271C; 1381; 1525A; 1525D; 1530; 1539; 1542A; 1544; 1635*; 1640; 1645A; 1651; 1653B; 1685; 1697; 2034C; 2301A. In future, all original documents will be archived with the Basler Afrika Bibliographien, Klosterberg 23, 4051 Basel, Switzerland.